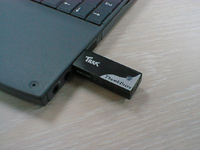 While it looks like one of those annoying security "dongles" for unlocking pricey software, the Trek ThumbDrive is actually an attractive alternative to all those monosyllabic, mobile megabyte machines: Zip, Jaz, Clik!, and Orb. The idea couldn't be simpler: No power supply. No external cables. No drive mechanism to wear out. Just a thumb-sized package packed with eight to 512 megabytes of nonvolatile RAM that acts like an extra drive when plugged into any available USB port. Retail pricing has not been set but the 128MB ThumbDrive is available now, with 256MB and 512MB ThumbDrives coming this Summer and Fall.